See also the Glendora Ridge Road 2013 page. 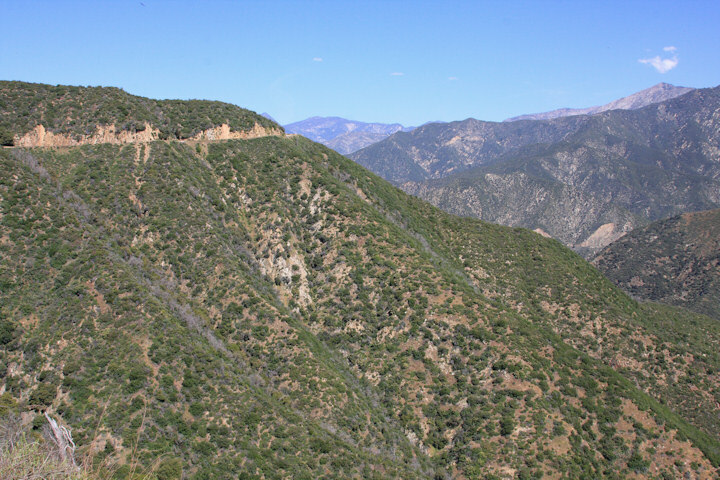 This gallery page is based on three visits to Glendora Ridge Road during the spring of 2010. The first was on April 9th, when it was too early for any massive spring blossom, although there were prominent displays of some species such as baby blue eyes and grape soda lupine. The second visit was a field trip by our CNPS chapter on May 15th. While this was close to the peak of spring bloom, an ideal time to visit this area, there were some species for which we were a little early, such as Pacific stone crop, perhaps because of spring being a few weeks later than usual. On this occasion, we traversed the 12-mile length of the road from west to east, stopping at five different locations. After lunch we walked the short Cross Trail near Mt. Baldy Village. The third visit was on July 10, as the spring bloom was drawing to a close. The panels: The following panels of photos are from each visit, and for the May 15 event, each of the locations where we stopped. It's early spring here, still with ample snow at the higher elevations of the mountains. There was no snow at the modest elevation of Glendora Ridge Road, 4,200 feet. From its western end, Glendora Ridge Road gradually gains elevation, and the nature of the flowering plants gradually changes. At this time of year there are fewer flowers to see at the western end. This stop, like the first one, still has not reached the area where the flowers are most prolific. However, grand panoramas of the mountains to the north and west can be seen. This stop was notable for the amount of Pacific stone crop (Sedum spathulifolium) spread across the face of the rocky cutting on the southern side of the road. 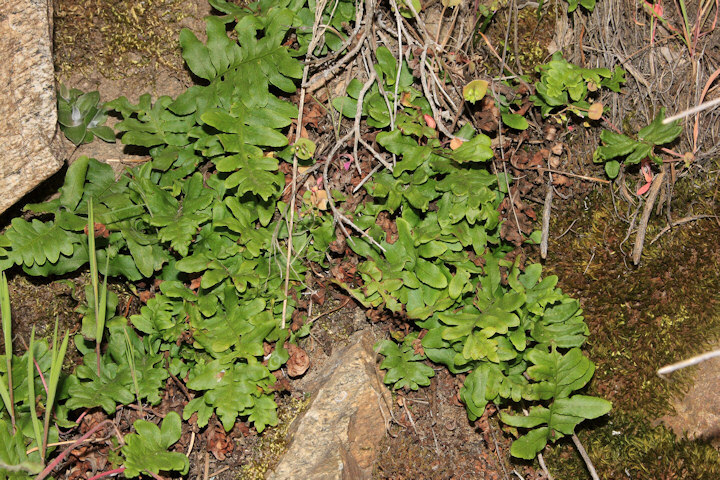 Here there are plants similar to those of the previous stop with a few new discoveries such as the foothill poppy and Bolander's woodland star. The Cross Trail begins almost at the western end of Glendora Ridge Road, only 0.2 mile from Mt. Baldy Village, and in the middle of the steep ascent of the road away from Baldy Village. There is no signpost to indicate the trail, which is relatively short and leads to an overlook of the valley where outdoor meetings have been held — a crude amphitheater. The final two pictures on this panel are not from the Cross Trail, but from the drive back across Glendora Ridge Road at the end of the day. The exact location was not noted. This panel of photos is from a special visit to Glendora Ridge Road to see the yellow mariposa lily. The peak of the spring bloom was over, but fortunately a few of the mariposa lily remained. It was a treat to find that the pitcher sage was in high bloom, together with a sprinkling of other flowers, some of which we had not seen during visits earlier in the spring. Thanks to Jane Strong for identification of plants and flowers. All images © 2010-2019 Graham Bothwell.